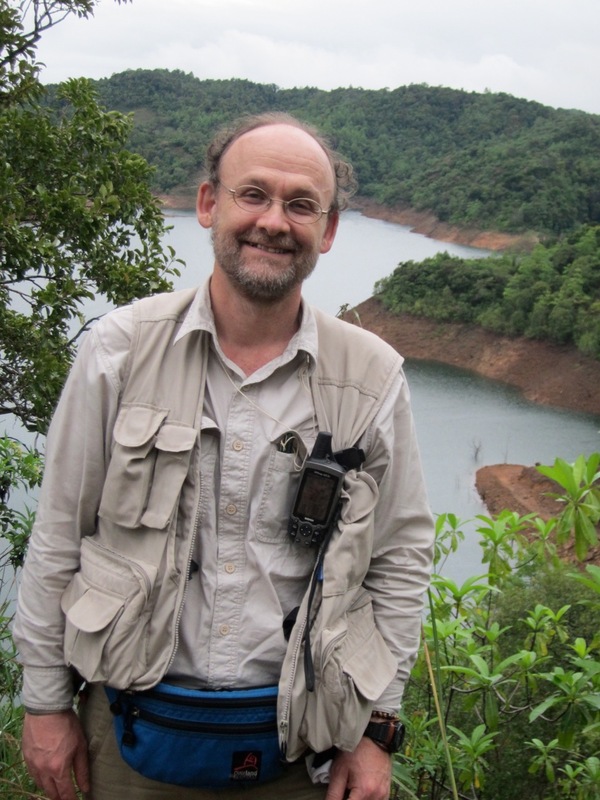 Michael Huffman, the author of The Monkeys of Stormy Mountain, describes what led him to become a primatologist, his experience researching macaques in Japan, and the surprising primate behavior he studies. What led you to your current field of study? One word would be fate. I’ve been interested in primates since I was three or four years old. My Mom would read me the book Curious George – I would always be asked to read that book. I also had some relatives who were missionaries in Kenya for a total of about 40 to 50 years, and they came to visit my grandparents. They showed me some photos in an album showing monkeys in their garden and I thought that would be the coolest thing to have – monkeys in the garden. What is the relation between Japanese monkeys and monkeys elsewhere? 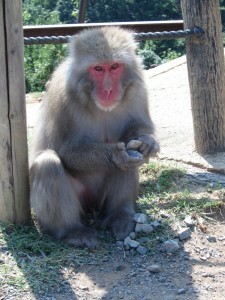 Japanese macaques are closely related to three other macaque species. The Japanese macaque, the rhesus macaque, which is found in India and China, the long-tailed macaque, which is spread throughout South- East Asia, and the Taiwanese macaque are all very closely related. The Taiwanese macaque, the rhesus macaque and the Japanese macaque, although they are classified as different species, can actually mate and produce offspring which can also reproduce. Are the monkeys at Arashiyama environmentally threatened? The monkeys there have been provisioned since 1954 – every day they are given some grain, soybeans or wheat or, depending on the season, some vegetables, fruits, chestnuts and things like that. 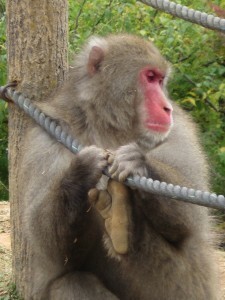 It was a joint effort that happened in several places around Japan in the early 1950s to habituate the monkeys and bring them out into the open so that scientists could study them and also as a tourist venture by local businessmen in these areas to generate revenue by bringing people closer to wild monkeys. So they are not really threatened as a population as their numbers are so big, but (monkeys in) many parts of Japan are being threatened because humans are expanding into areas and taking more of the natural forest away from the monkeys. How does provisioning at Arashiyama modify the monkeys’ behavior? Their home-range becomes smaller. In the early days when people were first trying to locate the monkeys to understand where they were moving around, they realized, not just at Arashiyama but at many places throughout Honshu, that this sub-species has very large home-ranges. So it was very difficult to locate them, but once they were able to lure the monkeys to one spot it changed the home-range by some considerable size. It’s now down to about two square kilometers, less than a tenth I would estimate of what their former home-range was. The Arashiyama group will spend a lot of time foraging in the forest in between feedings, and in the fall and the spring, when there are a lot of things that they really like to eat from the natural vegetation, there will be days when they don’t come (for feedings) and even if they do come they will leave very quickly. 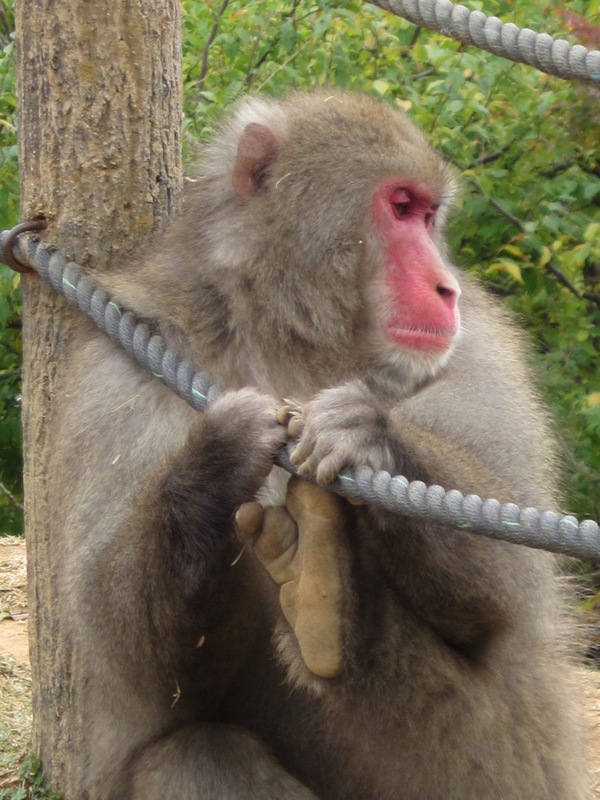 The group on Arashiyama exhibits some behaviors such as dental flossing. What is the significance of that? Clean teeth! There are other macaque species that show the same behavior. I know of one free-ranging group in Thailand where the whole population dental flosses. What do they floss with? Human hair, or sometimes coconut fibers. There is only one individual at Arashiyama now that does it, as it hasn’t spread through the population. According to papers written on the topic, the monkeys will look for long-haired humans, females mostly, and jump up on their backs and start plucking hairs and then dental flossing. I’ve seen the same thing in Taiwan. An older macaque with some teeth missing picked up some human hair and started flossing its teeth, and pulling out this grain in between the teeth, then eating what it pulled out. So it seems there’s some kind of pre-disposition in macaques for doing this. We have studied clay ingestion, this behavior called geophagy or the eating of earth. Monkeys will eat the clay from exposed cliff areas in different parts of their home-ranges and at Arashiyama they will eat it every day. We’ve written a paper where we propose that it’s due to their current diet where they eat a lot of the same things every day that can lead to an acid stomach. If you look at wild populations such as on Yakushima that are totally dependent on natural foods for their diet, geophagy is much rarer; it doesn’t happen every day but rather during times of the year when they’re eating lots of fruits. Eating a lot of one kind of food can lead to acidosis of the stomach and clay is known for absorption. It can take these acids and relieve the stomach very rapidly. Are there any other unique characteristics of the Arashiyama group? Stone-handling. It’s a cultural behavior. It’s been transmitted from generation to generation in the troop since about 1981 or 1982. I was the first to observe it in 1979 in one individual, and when I came back to Kyoto in 1983 I went straight to the mountain and saw what could have been 15-20 young monkeys playing with stones on the rooftop of the feeding station. After over 30 years of studying this behavior, it is now the longest actively studied cultural behavior in primates. We have 30 plus years of records and we’ve been able to show how it spread, how the behavior has changed over time, and how the complexity of the behavior has increased. We’ve also found this behavior in other populations of macaque around Japan, and found cultural complexities and different types of behaviors that show that there are different stone-handling cultures in these different groups. Why do the monkeys do this? We classify it as a form of solitary object play. It’s not something they do with other animals – in fact if another monkey is dominant they will try and take the stones away. A lot of the things they do with the stones make noise – they will rub stones over metal objects or wood, or they’ll clack stones together. I think also the feeling of rolling the stone in the hand or under the hand is important. There are about 48 different behaviors that Japanese macaques have been recorded doing. We’ve hypothesized that even non-adaptive behaviors can be socially transmitted and passed down and can continue long-term as a new behavior within a group. All of the cultural behaviors described up until now for most primates have to do with getting food. But stone-handing doesn’t help you get food, it doesn’t help you get mates – in fact young males of mating age will ignore female solicitations to continue playing with stones. Mothers within days of giving birth will continue to play with stones. So there’s got to be some kind of positive bio-feedback from doing this and we think that one is just the immediate pleasure from doing it but we’ve also argued for a possible long-term benefit which is regeneration of neural pathways that can deteriorate with age. What do you see as the future areas of research for primatology in Japan? There are some in the older generation who say that we’ve found everything and that there is nothing left to do. But something that is happening lately is the combining of new technologies to answer or re-look at old questions. This idea about the impact of stone-handling on cognitive ability or on neural regeneration for example – if we use a CAT scan we can actually see major differences between individuals. We’re combining a lot of different technologies to look at questions that have been out there for a long time, but are now able to look at in much more detail.